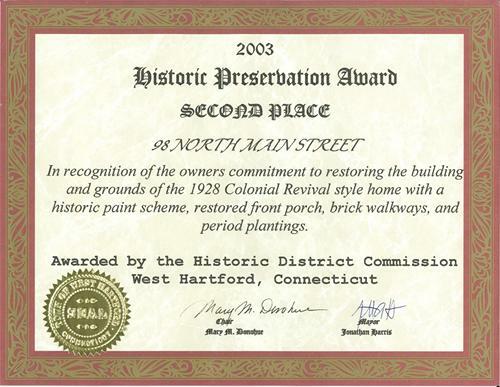 The 2nd place award for best historical renovation 2003 was awarded to Rick Bush for the work done on this home in West Hartford, CT. The standard to which the work on this classic West Hartford home was held was nothing short of perfection. Every surface was carfully restored to it's original state. In some rooms, fixtures beyond repair, were removed and replaced with modern fixtures and appliances. The interior, exterior, garage & grounds were completely restored.